Judy Garland didn’t have a clue. Agra, India is farther away from Kansas than Oz ever was. Everyone in America needs to visit India once. We are so incredibly blessed that it is scary. These handsome people are very friendly and they have so little. 1.5 million people in Agra, all hustling and bustling around in every sort of vehicle. People powered, horse powered and engine powered. My favorite are the hundreds of little multicolored Timpos. These are three wheeled scooters that seat at least 100 people. There I go again, hyperbole. Really, I think they can only get 10 people in one, but a Vespa is good for a family of four. Up at 05:00 this morning to go see one of the great wonders of the world, the Taj Mahal. We have all seen the pictures. It is truly beautiful and a wonder. I did not realize it but the Taj is a 40 acre site with many, red sandstone buildings and walls surrounding the famous white marble building. All of these are also wonders of architecture and construction. This is all about Muslim symmetry of architecture and philosophy. The white marble building that I always thought was “the” Taj Mahal is actually a mausoleum for a princess and number one wife of a 16th century ruler of India. It is a very interesting story, look it up. But, to my brothers, trust me, I was pretty good to you. It could have been a lot worse. I did not kill you. The detail and craftsmanship is amazing. The fit of millions of tiny pieces of semi-precious stone could not be done better with today's laser cutters. Three thousand of craftsmen worked 22 years to create this wonder. Wow! Having seen pictures of this place all my life, it is truly a gift to see it with my own eyes. While the day was overcast and the light wasn't the very best for pictures, I attach a few above that show the incredible detail of the work that was done. The place seems to float in space, surreal! I will let the pictures do the rest of this report. You can see Chris, Jim and Mercer in one of the pictures, can you find them? Lastly, Happy Birthday to my wonderful sister Edie Fagan, sorry I can't be with you today! - Bob S.
Bob is feeling a little under the weather today. He has a bad head cold so he is staying in at our great hotel to get over it. Jim, Chris and I head out in to the mayhem again to tour the Agra Fort and the Baby Taj. We are very glad we did. The Agra Fort is just as impressive to me as the Taj Mahal but I had never heard of it. 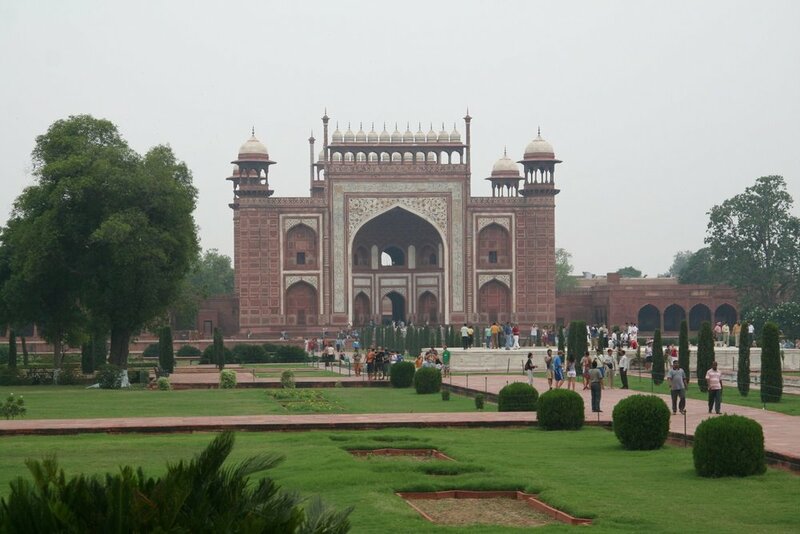 This massive structure was home of the Moghals of the 15th and 16th centuries. It is where the emperor that built the Taj Mahal was imprisoned by his son. The fort was constructed over many years by several Moghals. The style of each period is evident as you tour this place. Marble roof slabs supported by intricately carve marble brackets are a wonder to look at. The craftsmanship and attention to detail and symmetry are truly amazing. With all of our technology today, it is hard to imagine we could duplicate either the design or workmanship on this scale. We go back into the nightmarish traffic and street scenes to see the baby Taj. The Baby is a smaller version of the big one, slightly different in architecture but still devoted to symmetry. You get to see the wonderful marble inlay work here in much better light than you can at the Big Taj where only small flashlights are allowed within the tomb. We later went to a shop/museum where we observed this art of inlay which is still practiced; unchanged for centuries. Young men work in groups and each have a specialty which I understand they practice for life. One person chips out precise cavities in the hard marble slabs while his partners grind tiny pieces of semi-precious stone to fit the cavity created by their partner. They work in concert using templates created by the master designer. The fit is so precise that the gaps are far less than half a human hair. These teams work for months and years to create a single piece of art. This is an important cottage industry in Agra employing some 3,000 people. Then into the shop area where these finished works of traditional art are on display. Beautiful! And guess what, there is no duty due on these works when returning through US customs, thankfully. The reason is that the US has signed a letter with the Indian government exempting this traditional art form from tax in an effort to save these ancient skills. A very good thing. Off we go again through the city and into what you might call Agra suburbia. It is not much different than the city proper but the street scenes are more shocking. I watch children cleaning the open sewers with their bare hands and scooping the black sludge on to the street where the government truck never comes to pick it up. The hovels are very close to the street. Only the open sewer separates the dwelling from the absurdity in the street. Cows wander any and everywhere and are evidently welcome inside the homes. Women harvest the cow dung, shape it into round disks and dry it for fuel for cooking. The odor is pervasive and you don’t get use to it. In our wonderful Sheraton Hotel behind its big wall cleaning staff are constantly walking around spraying sandalwood to cover the odor. The sandalwood gets old after a while but much better than the alternative. This is a great hotel with everyone working their heart out to please. Then we head back to main street Agra and to the embroidery museum/shop. Agra has many surprises and this was a highlight. The Kohinoor Jewelers have been in business for generations. Mr. G. G. Mathur the owner showed us around personally. The museum has a collection of eight embroidered tapestries that are unbelievable. The tapestries and Mr. Mathur were the subject of a major National Geographic article. The tapestries are so great that when they are unveiled one by one they literally gave me chills. A work of art has never done that to me before, and I love art.